Michigan Farm To School - Blog: SAVE the DATE! Setting the Table: Preparing for the Future of Local Food. Wednesday, November 7th, 4:00 p.m., NCMC Iron Horse Cafe. SAVE the DATE! Setting the Table: Preparing for the Future of Local Food. Wednesday, November 7th, 4:00 p.m., NCMC Iron Horse Cafe. 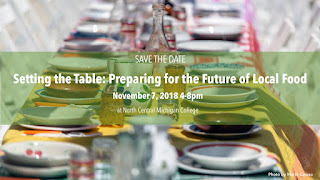 "Setting the Table: Preparing for the Future of Local Food"
What are the needs and what we can accomplish together to enhance local food and farming in our community? Five years ago the Petoskey-Harbor Springs Area Community Foundation convened a community meeting concerning their Good Food Initiative. At that meeting community members provided valuable input on immediate and long-term priorities for local food and farming activities. At "Setting the Table" we will revisit the good work done at that meeting. Our objectives will be to celebrate the successes of the past five years, gather community input to identify new priorities, and set goals for advancing locally grown food in our region. The event will include a Certified Local Food Event meal for all participants. Bet thinking of who you will choose for your "Local Food Hero"!